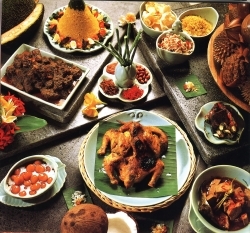 Indonesian cuisine reflects the vast variety of people that live on the 6,000 populated islands that make up Indonesia. Indonesian cuisine is as diverse as Indonesian culture, and has taken on culinary influences from many sources. It varies by region and is based on Chinese, European, Middle Eastern, and Indian precedents. Throughout its history, Indonesia has been involved in trade due to its location and natural resources. Indonesia’s indigenous techniques and ingredients, at least in the Malay World parts, are influenced by India, the Middle East, China and finally Europe. Spanish and Portuguese traders brought New World produce even before the Dutch came to colonize most of Indonesia. Indonesian island of Maluku is famed as “the Spice Island” also gave contribution on the introduction of native spices to Indonesian and global cuisine.The ‘typical’ Indonesian meal might be described as being based on rice, with several savoury side dishes of vegetable, fish or meat or poultry, accompanied by chilli-hot condiment or sambal, with peanuts, crackers (krupuk) or fried shallots to provide a crunchy contrast. While such a description might be valid for much of Java, Sumatra and Bali, in other areas of the archipelago, the staple might be sago, cassava or maize. The most popular dishes that originated in Indonesia are common across most of Asia. Popular Indonesian dishes such as satay, beef rendang, and sambals also favoured in Malaysia and Singapore. Soy-based dishes, such as variations of tofu (tahu) and tempeh, are also very popular. In fact, tempeh is an adaptation of tofu to the tropical climates of Indonesia. Rice is the main food of millions of Indonesians, is far more than just a staple food. The plant is perceived to have a soul or spirit and is therefore subject to many ritual observances during growth and harvesting. Although there are dozens of varieties of rice in Indonesia, the most common fall into two basic categories: long-grain polished white rice and glutinous rice. The former is eaten as staple, while glutinous rice is used to make dessert, cakes and snacks. Glutinous or sticky rice (ketan or pulot) is either white or purplish-black (ketan hitam), with a wonderful nutty flavour. Rice is most often eaten as plain rice (nasi putih) with just a few protein and vegetable dishes as side dishes. It is also served, however, as ketupat (rice steamed in woven packets of coconut fronds), lontong (rice steamed in banana leaves), intip (rice crackers), desserts, noodles, brem (rice wine), and nasi goreng (fried rice). In western and central Indonesia, the main meal is usually cooked in the late morning, and consumed around midday. In many families there is no set meal time where all members are expected to attend. For this reason, most of the dishes are made such that they can last and remain edible even if left on the table at room temperature for many hours. The same dishes are then re-heated for the final meal in the evening. Most meals are built around a cone-shaped pile of long-grain, highly polished rice. A meal may include a soup, salad (or more commonly sauteed vegetables with garlic), and another main dish. Whatever the meal, it is accompanied by at least one, and often several relishes that are called sambals. In eastern Indonesia, where the natives are more influenced by Pacific islander cultures such as on the island of Papua and Timor, the meals can be centred on other sources of carbohydrates such as sago and/or grain.